The five door lounge series is powered with a 1.4-liter MultiAir Turbo four-cylinder 160 horsepower and 184 pound-feet of torque. Power is sent to the front via a manual transmission. Overall, the smaller vehicle handles responsively, and has pretty decent get up and go for the urban (and not so urban) traveler. Our test model came equipped with the 1.4 liter four cylinder, 160 horsepower, turbocharged MultiAir engine backed by a six speed Euro Twin Clutch transmission. It was peppy, cornered like the dickens, and steering was both fast and accurate with no correction needed. 24 for city and 33 for highway; with a combined of 27 mpg. For this size vehicle going up again the KIA Soul, Honda Fit and MINI, it's not stellar ratings and there is room for improvement. It's economical, getting 24/33 miles per gallon and 32 overall. Not phenomenal, but certainly more economical than many cars. It uses 3.7 gallons per 100 miles of driving, and federal officials say you can save $1,000 in fuel costs over five years compared to the average new vehicle. Your annual fuel costs will run about $2,100, based on 15,000 miles of driving annually with gas costing $3.50 per gallon. Fiat, my first car some 30 years ago, still remains a favorite, in the upscale smaller category. This car is distinctively Euro in styling and is just that - different. There are not two zillion of them on the road. Yet, the Fiat 500 L is affordable, practical, a safe and well-designed vehicle - inside and out. The utility of the car is simply smarter than most. For instance, the wrap-around windows are odd looking for traditionalists, but yet, provide a 360 view. With so many cars having built in blind spots, the 500 L has virtually none. Don't let the smallness fool you. There is plenty of leg room and MTO versatility. Fiat has taken seating 'rubrics' to a new level; its personal and custom - each and every drive depending upon how many passengers you have. That's ingenuity. This is one of my personal favorites for this model year. I like 'em small, but I also like 'em distinctive, fast and practical. The 500L fills the bill on all fronts, and goes on my personal list of cars to look at when I get a new one next year. And because of its tall profile that provides nearly 360 degree views, and the fact that you sit up higher in this car than many others, visibility is excellent in all directions in the 500L. Clearly, it's also a terrific car for those of us- like this writer- who are shorter than five feet five tall. The 500L has a lot going for it: It's roomy - almost shockingly so given its small exterior size. There's about 40 percent more interior volume than the 500. The interior is a colorful, interesting place to be with all manner of shapes, colors, designs and materials of different textures. And there are tons of different seating arrangements that you can use with the 500L, thanks to an adjustable back seat that can be folded, flipped or slid to provide more cargo room or leg room. Driver Air Bag, Passenger Air Bag, Head Air Bag, Rear and Side Air Bags, 4 Wheel ABS, Brake Assist, ESC, Traction Control, Hill Start Assist, Cruise Control. Advanced multistage front airbags, supplemental front seat mounted side airbags, driver inflatable knee bolster air bag, electronic stability control, hill start assist, and quite a number of other items. UConnect is a fabulous Fiat tech feature with AM/FM/Satellite/Bluetooth for hands-free speaking, and all easy to use. Nice sound system supported with six speakers. Our test model was a 500L Lounge, in Grigio Chiaro (Graphite Metallic), with a base price of $24,195. Standard equipment included front airbags, supplemental front seat mounted side airbags, supplemental Front Seat-Mounted side airbags, driver inflatable knee bolster airbags, anti-lock brakes, power windows, door locks and steering, cruise control, hill start assist, Uconnect 5.0 AM/FM Bluetooth, satellite radio, six speakers, steering wheel mounted audio controls, leather steering wheel, heated front seats, tire service kit, tilt telescope steering column, heated front mirrors, chrome exhaust tips, and heaven only knows all what else. An extremely well equipped car before you even talk options. By the way, Uconnect is unquestionably one of the easiest audio/navigation touchscreen systems around. It has larger, easy to understand icons and symbols, is totally intuitive and comes with a large screen and large print. Again, a wonderful product for everyday people to use, particularly those who have sight issues. With the Premier Package which included an upgraded Uconnect system, a rear view backup camera and ParkSense Park Assist, which cost $1,745, the final price of our loaded 500L was $25,495. Our test model came equipped with the 1.4 liter four cylinder turbocharged MultiAir engine backed by a six speed Euro Twin Clutch transmission. The boxy look has been accepted in other designs like the KIA Soul and the Nissan Cube. Of course, Scion and other brands are using more of the boxy look. But the Fiat "boxy" is different yet. Characters, confidence and unique are the traits a buyer has to drive this. And fun, too. Its 17" alloy wheels give it sparkle and real hugging of the road. There is plenty of packing room with 23.1 cubic feet of cargo space. And, it's a hearty car weighing in over 3,250 pounds. Loved it! But it will take some people time to get used to it - and I suspect they will love it too. 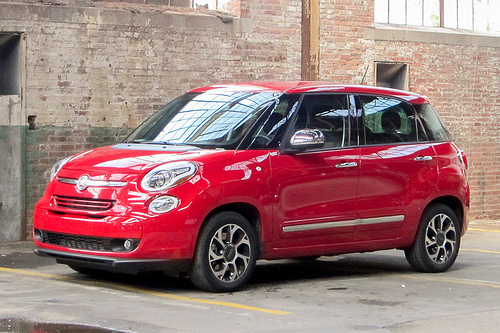 The 500L is probably one of the most distinctive cars on the road. You can't miss its tall, squared off profile, and it looks elegant in an oh-so-chic way. Fiat certainly did a successful job of camouflaging the tall, chunky car by the careful use of darkened window glass and a large trim strip that goes along the sides of the car and visually breaks up the car's mass so that it doesn't look nearly as tall or heavy as it is. 4 years, 50,000 mile warranty. Twelve (12) months of unlimited road service. The car comes with a 4 years/50,000 mile warranty and 12 months of unlimited road service.